Online bingo sites come in all sorts of shapes, sizes and as we’re sure you’re aware, colours. That’s great news for players. It means you don’t have to sit in the same bingo site, swearing at the screen and cursing your keyboard every 20 seconds. But one bingo site in particular that both attracts customers, but more importantly keeps them is Gossip Bingo. You can read our full review of Gossip Bingo here. Players stay for good reason too, with the online environment available at Gossip Bingo, people who sign up are happy not only with the site, but the community that surrounds it. Open up the web-page and you’ll be greeted with one of the more colourful designs to grace the web. There’s no dark and dingy greys and early 2002’s banner – but instead a chic hot pink design and what appears to be a spin off of Disney Pixar’s ‘Up’ in the background – Have a look to see what I’m on about. Gossip Bingo is home to a wide variety of games – as you’d expect from a bingo site – ready and waiting for whenever you fancy hitting the slots, tables or balls. The usual, popular British 90 Ball Bingo is available as well the American counter-part of 75 Ball Bingo all under the same roof. With your bingo basics covered, it’s hard to imagine anything else that you’d need. BUT HOW ABOUT 100+ CASINO AND SLOT GAMES. That’s right, they’ve got everything from Love Island Bonus, Monopoly Mega Movers and Jumanji. That means you can try your luck at loads of other bits and pieces, if you’re out of luck in the bingo rooms. Fancy a crack at Gossip Bingo but don’t fancy to use your well earned cash to chance the site? Not a problem. With Gossip Bingo, free bingo is everywhere! 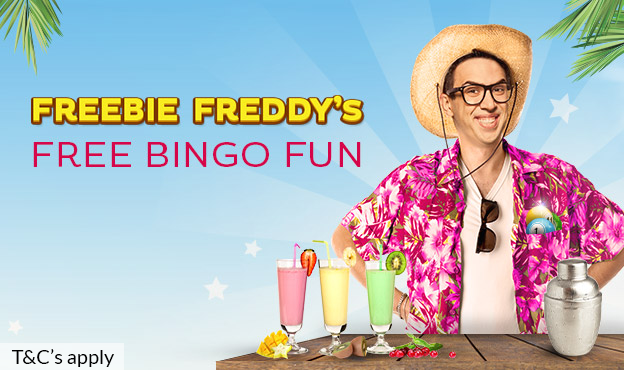 Freebie Freddy is waiting on hand to introduce you to loads of brand spanking new free games, putting you in with a chance of winning up to £26,000 every month. Your new player bonus comes in the form of The Biggie Room that’s free to play to new customers for 3 whole days, no deposit needed. The Biggie: Claim your very own £50 jackpots in The Biggie! Unlock this room with just £10 for two whole days of play. The Grand: Unlock this room for just £20 for two whole days of free bingo fun. With the chance to win £100 prizes all day and get a big ol boost for your bingo winnings! The Ultra: Unlock this room with a deposit of £30 for two whole days in one of the best free bingo rooms ever. Loads of £250 jackpots up for grabs when you play here. The Supreme: Supreme for a reason – the biggest free bingo jackpots available on Gossip Bingo. Enter The Supreme with just £50 and play for two days to win the amazing £500 prizes! Our favourite new customer offers always involve free money, and sure win spins? Well that’s just another added bonus. 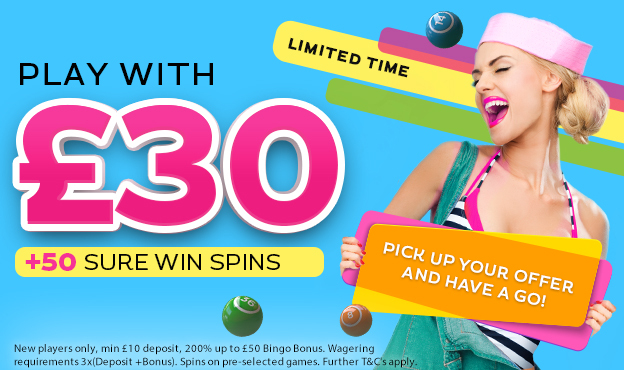 Deposit £10 – Play With £30 + 50 Sure Win Spins: New players only, min £10 deposit, 200% up to £50 Bingo Bonus. Wagering requirements 3x(Deposit + Bonus). Spins on pre-selected games. Further T&C’s apply.